At night, Genevieve has the option of snuggling up next to her reader (usually, but not always, me), or sitting in the "Mommy Seat". The Mommy Seat is created by [me] sitting cross-legged, and Genevieve sitting in the space, leaning against me, her legs over my legs. I love the Mommy Seat. We have a regular stack of books that Genevieve likes to read at bedtime. Among them is I Love You, Good Night . I mostly bought it because it was a bedtime book with mice in it, but it quickly became one of my favorite bedtime books. 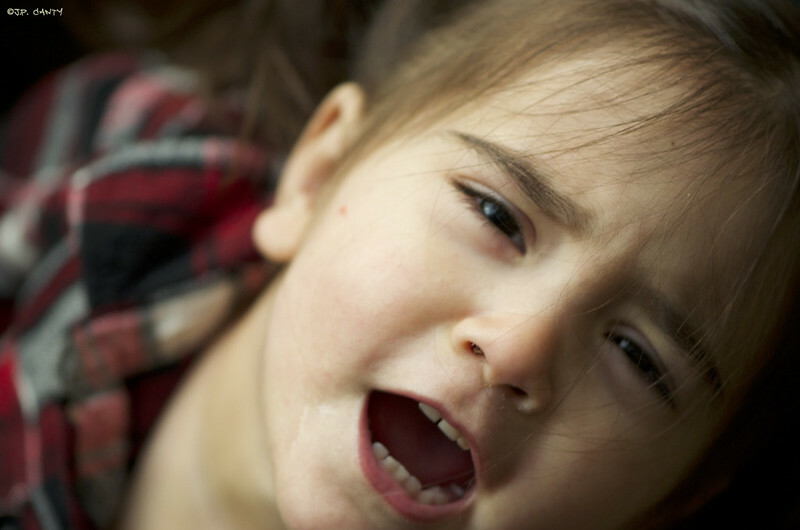 It's short, sweet, and gives lots of opportunities for extra kisses and hugs at bedtime. (Pro-tip from Gramzie: If there are kisses and/or hugs in the book, there are kisses and/or hugs to illustrate the point in person.) The book employs simile, which I love, and it just gives me all the oxytocin-filled warm fuzzies to read it with Genevieve. There's a page in the book, showing the little mouse wearing boots and a raincoat, and enthusiastically splashing in puddles. The text reads, "I love you like boots love splashing in puddles." Genevieve has been OBSESSED with this page. 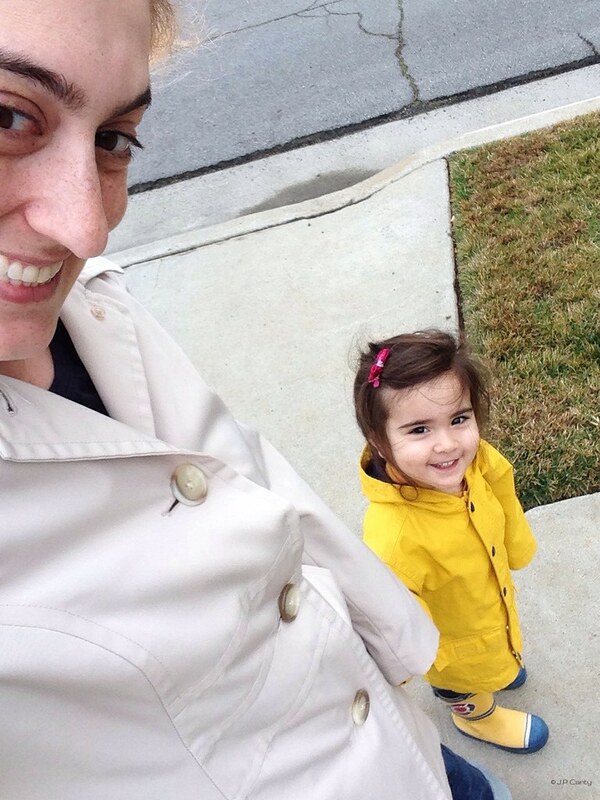 As it happens, in preparation for rainy weather - which has yet to *really* make its debut - we bought her a yellow raincoat and matching rain boots. Genevieve LOVED the boots- she could put them on and take them off easily, by herself, and stomp around in them. What's not to love? She has been DYING to wear them out and splash in puddles. So when the weather teased us with the promise of a thunderstorm, I told Genevieve that we would go splashing in puddles after her nap. Our "storm" lasted maybe fifteen minutes. But, a promise is a promise, so when she woke up, we suited up in our raincoats and rainboots, and went on the hunt for puddles to splash in. It's not the size of the puddles that matters. You can see in the photo that the street isn't even wet. We found four "puddles" in gutters- which were likely to be more mud, antifreeze, and motor oil (given the color). But, I didn't split hairs and I let Genevieve splash away. She was THRILLED. 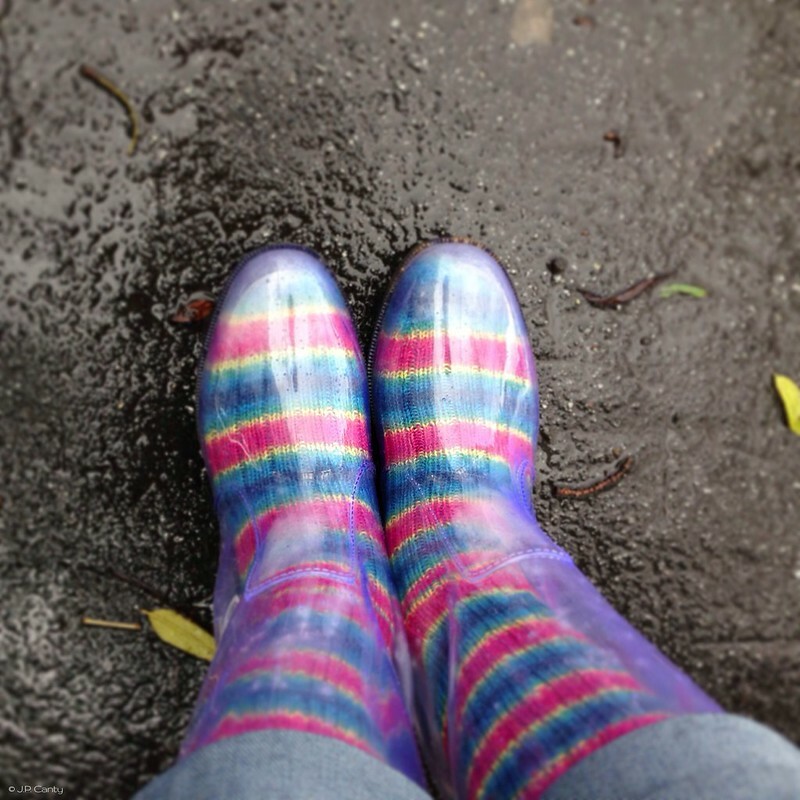 Of course, I wore my boots, and raincoat, too. These are Skacel Peek-a-Boots. I got mine at Purlescence. 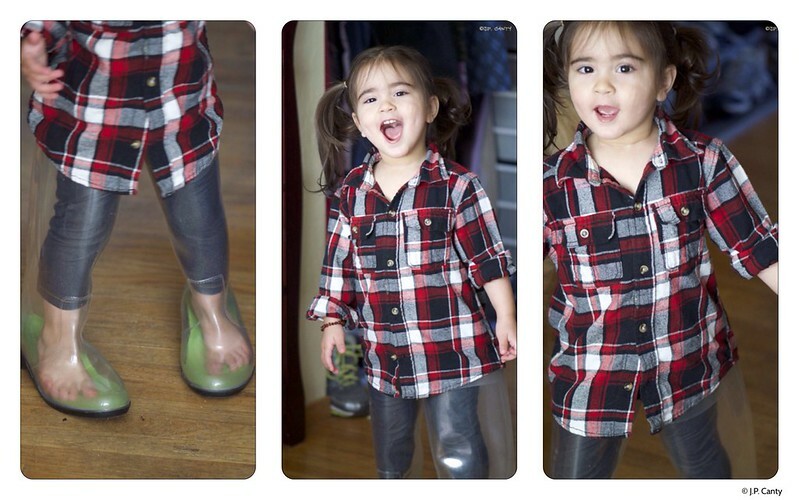 Genevieve also loves playing in *my* rain boots. Rainboots and flannel. She pulls it off. "What do you MEAN these don't come in my size?!" "I'll just borrow yours. We'll wear the same size soon enough." We've been promised more rain, and I'm hoping the weather delivers. I'm not looking forward to another drought (soooooo cliché, California!). What *am* I looking forward to? Some epic puddle splashing with my favorite Mouse. I love that more and more of you comes out of her as she gets older. We do what you call the "mommy seat" too. :) It's one of my favourite times of the day. I legit was having a terrible day but now how can I after seeing her adorable face? 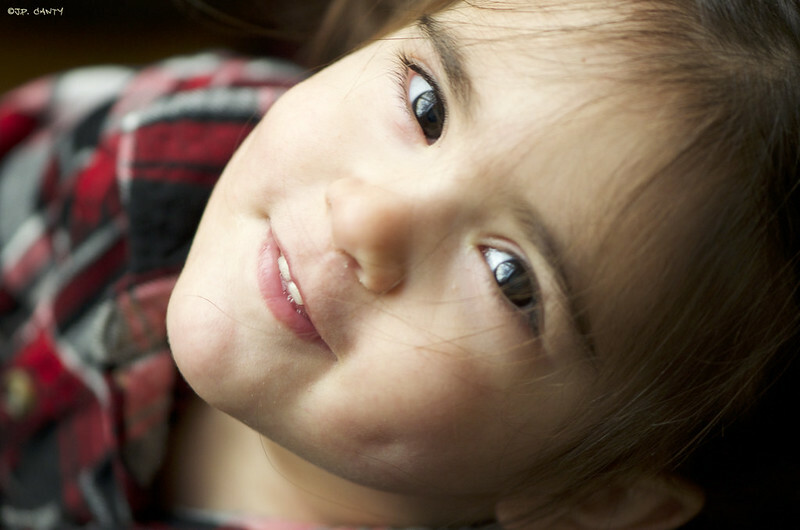 She looks so much like you an Gigi! One of our favorite bedtime books has mice in it too! Check out Lullaby Moon by Rosie Reeve. I love the illustrations. So adorable and what fun splashing in puddles!